Treadmill Workout: Watching the sun rise while working out on the treadmill, completely enveloped by tranquility in an uninhabited bay, surrounded by porpoises and seals is a magical way to start the day. There is a TV on the sun deck if you would like to stay in touch with world news, or you can plug in your iPod into the treadmill port or sun deck surround sound. You can also choose to chat to your friend on the neighboring treadmill. Waterski: Organize it with the crew so that tender will take you out. 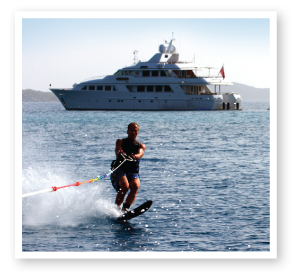 Did you know that waterskiing can burn up to 200 cals per 30 mins? Kayaking: Discover the hidden corners of Penobscot Bay in Maine. Kayaking is great for cardio as well as muscle toning. Average 170 calories per 30 minutes. Snorkeling: while relaxing and peaceful, snorkeling is a great way to stay active while on board. Paddle Boarding: An excellent exercise for core training. Hiking: Explore the nature trails in each port that you visit. Hiking burns 200 calories per 30 minutes. Lady J Boot Camp: A crew member will whip you into shape with his fun filled pre-breakfast cardio workout on the sundeck! Mountain Biking: Lady J carries 5 mountain bikes for charter guests to explore the islands. The Captain suggested the extremely scenic coastal road from Camden to Rockport, Maine. Average 300 calories per 30 minutes. Swimming: The great thing about a yacht charter is you’ll always have beautiful waters surrounding you. Swimming at a moderate pace burns 200 calories per half hour. Deck Climbing: Just climbing up and down the three flights of stairs from your cabin to the main deck—to the bridge deck—to the sun deck is a workout in itself! Climbing stairs burns 275 calories per 30 minutes! After all this hard work and activity, a dip in the on-deck jacuzzi is the best way to relax and refresh in style, with a rum punch in hand. All calories burned estimates are approximates based on 150lb person. These may vary from person to person. Hiking Monhegan Island in search of Fairy Houses | Lady J offers 2 paddle boards | 2 Treadmills are ready for a fabulous workout. A flexible general arrangement is very important for guests in a successful charter yacht.